We are excited to announce that Horseshoes Valley Dental has added a piece of CAD-CAM dental technology called CEREC® to our services. With this, we can make custom crowns and onlays (partial crowns) with the most advanced dental material in the world. And all in the same day! CEREC® is an advanced dental restorative system that allows you to have a number of previously time-consuming procedures – including crowns, veneers and white fillings accomplished in just one visit. Chairside: The technology is used while you are in the dental chair, right in our office. Economical: If time is money, this feature pays for itself! Restorations: The procedure restores your tooth to its natural beauty, function and strength. 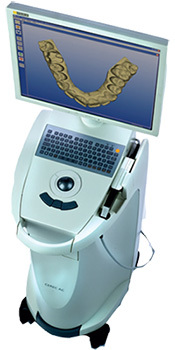 We’re proud to have this proven system in our office, ready to create perfect, immediate restorations for our patients. Ask us for a demonstration of CEREC®’s incredible technology, and find out how it can make your next ceramic restoration easy, effective and attractive!